During the time of slavery, enslaved African Americans sought to gain their freedom through escape and flight. These Freedom Seekers were often assisted by others who were opposed to slavery. Often referred to as the Underground Railroad, there were numerous escape routes throughout the United States. Loudoun County was part of the routes to the north, west and east. Loudoun County is home to four National Park Service Network to Freedom sites: the Loudoun County Courthouse, Melrose Farm in Waterford, Oatlands Historic House & Gardens and the Thomas Balch Library. A series of talks during Black History Month will discuss the stores at each of these locations. All talks start at 2:00pm and are free and open to the public. Born and raised in Leesburg, Leonard Grimes was an early organizer of the Underground Railroad in Washington, D.C., and became a prominent pastor and antislavery activist in Boston. Dr. Deborah Lee will present her research on Grimes and his high-profile trial in 1840 at the Loudoun County Courthouse for helping Patty Douglass and her six children escape from slavery. The snow date is February 13. Loudoun County Courthouse, 18 East Market Street, Leesburg. Enter at the old courthouse on King St.
to discover how public opinion of their efforts sparked intense national debate. Research into the enslaved is often aided by newspaper advertisements that owners placed about freedom seekers. 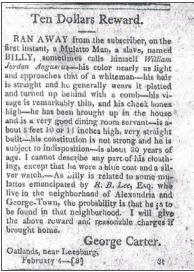 Referred to as "runaway slave ads", historian Bronwen Souders will share her research into over 200 ads that were placed by the owners of Loudoun&apos;s jailer in the local Loudoun newspaper, The Genius of Liberty, between 1817 and 1842. These events are sponsored by the Black History Committee of the Friends of the Thomas Balch Library; Gary M. Clemens, Clerk of the Circuit Court: Oatlands Historic House & Gardens: and the Waterford Foundation. 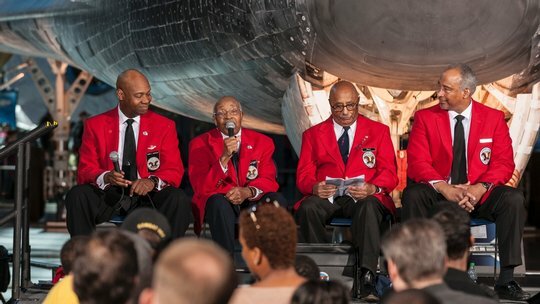 Each February, the Smithsonian National Air & Space Museum Steven F. Udvar Hazy Center celebrated the significant contributions African Americans have made to the flight and space exploration despite the overwhelming obstacles they had to overcome. Visitors enjoy presentations, hands-on activities, and stories and may have the opportunity to meet astronauts, fighter pilots and other who will share stories of their challenges and accomplishments. They also learn about inspiring historic figures like Bessie Coleman through reenactments or store times.